Porcelain Laminate Veneers are ultrathin shells of ceramic and are bonded on the front of your teeth. They are used to correct cosmetic defects on teeth or to correct the bite (the way the teeth come together). Cosmetic imperfections that can be corrected with veneers include teeth that are slightly crooked or stained, chipped teeth, gaps between teeth or uneven teeth. In the past, the only way to correct these or other imperfections was to cover the teeth with a crowns ( caps) . Veneers have several advantages over crowns. There is no „dark line“ that is sometimes seen with older front caps. They transmit light better and, therefore, have a more translucent appearance giving a natural, esthetic look. 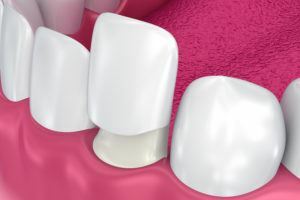 Veneers do not require the massive grinding of tooth structure that caps do, yet, they accomplish a lifelike esthetic result. Without question, porcelain veneers look the best and last the longest.. 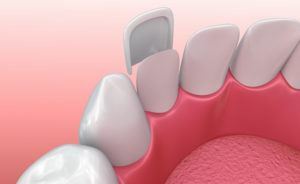 The procedure usually requires some slight to moderate tooth preparation (drilling). These veneers are about 0.3mm to 0.5mm in thickness. Once bonded into place, the porcelain veneers become very strong . They have a „life like“ appearance with the strength, beauty, and durability only porcelain restorations can afford.. The success rate is high, and they can last up to 15 or more years. Anything that will break your natural teeth can break the porcelain veneers, for example, hard candy or frozen candy bars. Veneers are highly stain resistant. They are a good treatment choice when all the front teeth are being restored.